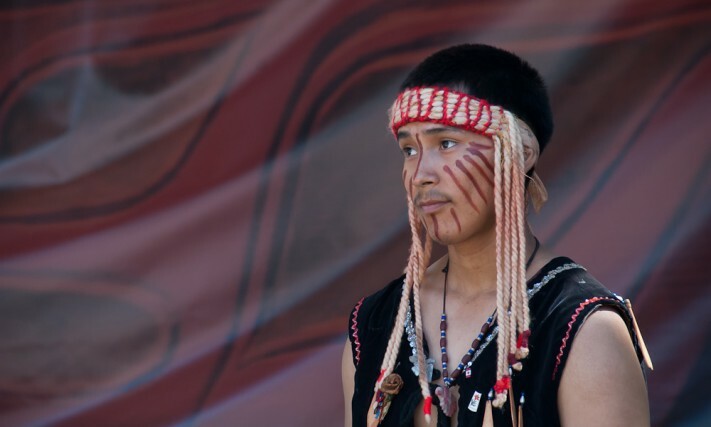 A celebration of living culture: Toque & Canoe reflects on Victoria's Aboriginal Cultural Festival. I’ve had an unforgettable year, travel-wise. I spent seven months in the South Pacific and Asia, and I photographed traditional performers wherever I travelled. But it recently occurs to me that after 51 years in this country, I’ve never tried to pay visual tribute to aboriginal culture here. 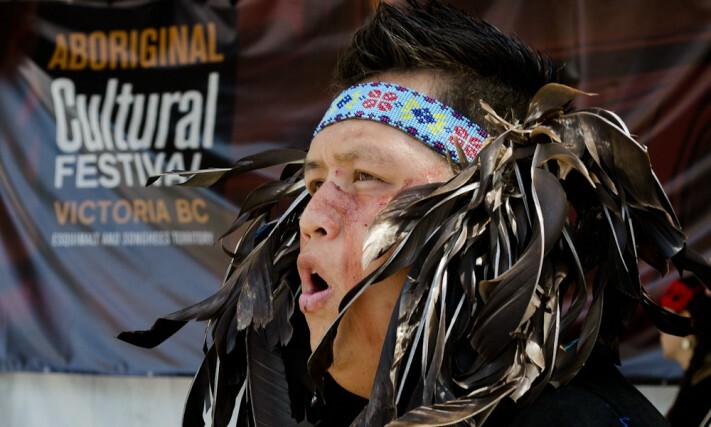 And so, along with photographer Tom Ediger, I make my way across the Strait of Georgia, or the Salish Sea, as it’s increasingly known, to B.C.’s capital, for Victoria’s 2015 Aboriginal Cultural Festival. I’m not quite sure what to expect. It’s a busy Saturday, and thousands of people are strolling the inner harbour. This is the Victoria I remember: buskers, bagpipes, buses and immense hoards of tourists. But through the bustle and noise, I make out the sounds of drumming, and I head over to the courtyard of the Royal B.C. Museum, where the action is getting started. 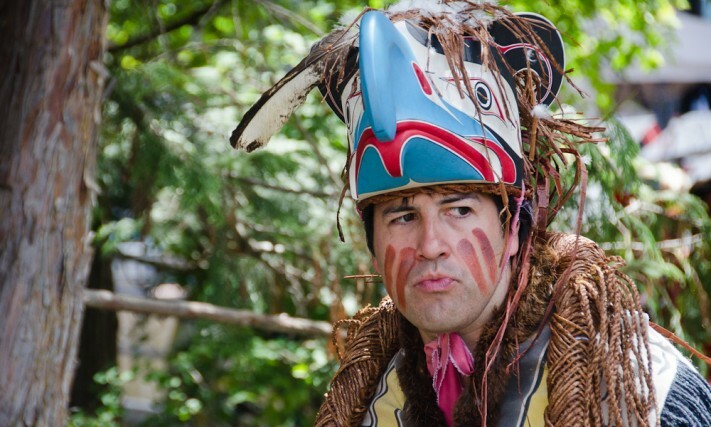 Victoria’s Aboriginal Cultural Festival is three days of food, singing, dancing, guided tours and artisan displays on the grounds of the Royal B.C. Museum. 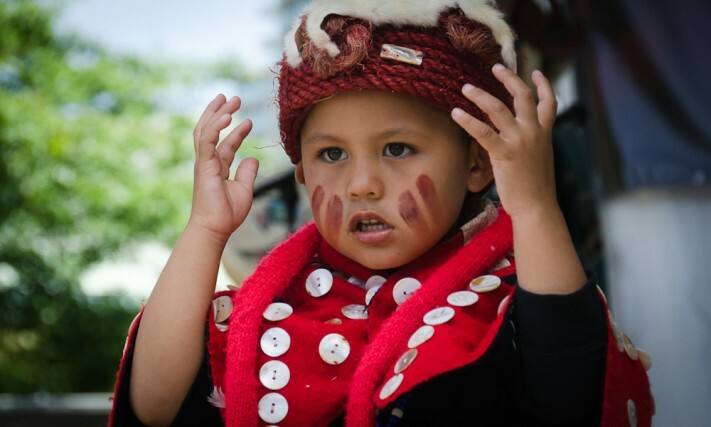 Each day honours one of the three major cultural groups that make up Vancouver Island’s First Nations: Friday is Coast Salish Nation Day, Saturday is Nuu-chah-nulth Nation Day, and Sunday is Kwakwaka’wakw Nation Day. 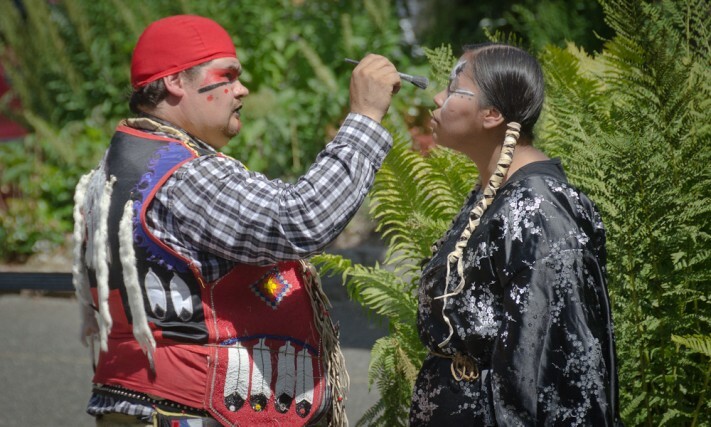 After taking in spectacular performances that feature traditional dance and singing, I make a point of attending Andy Everson’s walk among the house poles and mortuary poles of Thunderbird Park. He’s a performer and historian with a master’s degree in anthropology, and he points out the subtle interplay of symbols in the sculptures. I’m surprised at the number of young people here, dancing and drumming and selling their artwork. It reminds me of the South Pacific islands, where teens and young adults make up the bulk of traditional dance companies. Some of the dance groups here have an average age of about 24; contrast that with the UK and the rest of Europe: have you ever seen an English Morris dancer under 50? There seems to be a friendly competitive spirit among the dance troupes; they know each other and socialize together over the course of the festival. 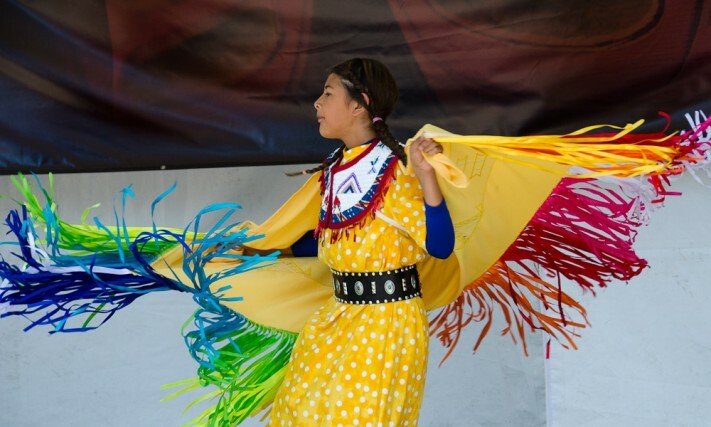 Some of them have come a long way to be here this weekend, and photos of dance performances decorate their Facebook pages as the festival progresses. The rest of the crowd is a lot less formal, a typical summer mix of locals, American tourists and a smattering of people from across Canada, vacationing with their families in one of the nation’s most beautiful cities. I thought I knew downtown Victoria; I lived there for three years. But as historian Mark Albany takes me along the waterfront, I see it through First Nations’ eyes: the clam beds that still live in front of the Empress; the muddy flats here and there that, historically, were perfect for beaching canoes. These were life-sustaining resources for the Esquimalt and Songhees peoples, and were among the first to be taken away with the arrival of Europeans so many years ago. I am shown the remains of creek beds and campsites, where, for centuries and longer, First Nations from all over Vancouver Island would stay as they did business with each other. Victoria was a big trading hub, and became one of the major centres of transmission for smallpox and other European-borne epidemics. Mark tells these stories without bitterness: they’re simply facts, realities that have shaped their modern world. Later I meet Leslie McGarry who guides me through some of the First Nations art collection at Swan’s Hotel and Brewpub downtown. Her own cultural roots run deep here on the island, though her people came from a bit further north. Without fail, each speaker or performer from outside the region takes a moment to thank the Esquimalt and Songhees Nations, on whose traditional territory we are standing. I meet dancers as young as three years old; they take their work pretty seriously. I stop to photograph Daniel Wells of Lil’wat as he applies the finishing touches to a boy’s makeup. He explains that not just anyone can wear it; young Quyiyxis had to earn the right through fasting. 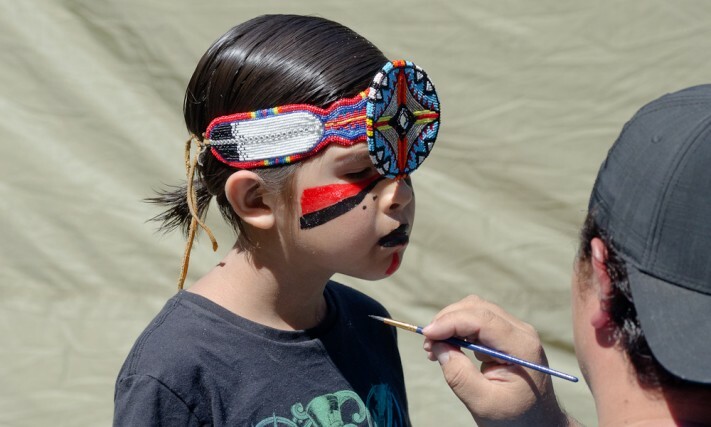 I learn that in all these West Coast cultures, songs and dances and symbols are proprietary—they belong within families and must be gifted to you before you have the right to use them. Despite the focus on traditions and history—the dances, the costumes, the stories—I sense little nostalgia among our hosts here. 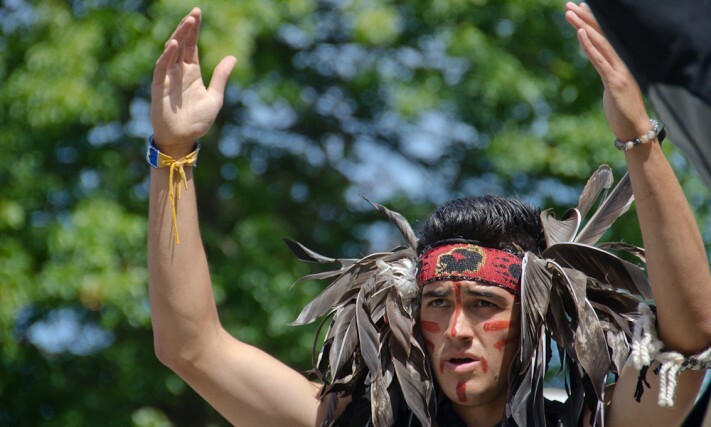 Aboriginal culture in Canada is alive; everyone speaks of it in the present, not past tense. I leave the festival energized and optimistic. The drumbeats and the smiles stick with me. And as I catch the ferry back to Vancouver, emcee George Taylor’s words ring in my ears: “Never forget—we all have a culture. We all have stories.” I’m honoured that these singers, dancers, elders and teachers have taken the time to share theirs with me. For more on our collaboration, feel free to peruse our earlier story Eating Turtle Island: Aboriginal cuisine goes mainstream, along with an interview with author Kim Gray about her experience researching this new culinary trend.